The Vancouver Area Brass Band Society serves as a non-profit coordination body for brass instrument related groups, events, and interests in Vancouver, Canada, and the surrounding area. Author Brian Stride has made a major update to the History of Brass Bands in BC section of the VABBS web site. The updates are primarily in the First Nations section and include many new photographs, references to new articles, and a timeline that attempts to correlate events in the First Nations communities with developments in the British brass band scene (primarily in the mid-1800s). Also, there is a new separate section on residential school brass bands. Vancouver TubaChristmas on 2011 December 17! Tubas, Euphoniums, Baritones, Sousaphones, Helicons... all playing favorite Christmas carols for the public to enjoy! Performance is at 12pm at the Granville Island Public Market courtyard. It's FREE for the public to come watch and enjoy! The "Touch of Brass" quintet will be featured on CBC Radio 2 (British Columbia) on Wednesday, August 27, 3:30PM. On November 25, 57 brass and percussion players assembled for a brass band reading session under the baton of Elgar Howarth. While the Little Mountain Brass Band made up the core of the reading event, there were an equal number of players from other groups, including community wind bands, the Salvation Army and professional musicians. The session included readings of "All in the April Evening", "Cross of Honour", Elgar Howarth�s "In Memoriam, R.K." and "La Gazza Ladra." See photos from the event. Vancouver Area Brass Band Society is pleased to announce it is presenting a brass band music reading session with renowned performer, composer, conductor, and adjudicator Elgar Howarth in Vancouver on November 25. See the Events page for details. Brian Stride has completed a major enhancement to the Research Project: History of Brass Bands in BC. The World of Brass web site has made available a podcast of brass music. On January 28, two Vancouver area bands participated in the 2006 Northwest International Brass Band Festival in Bellevue, WA, joining four bands from Washington state. The two bands were Little Mountain Brass Band and the Cariboo Hill Temple Salvation Army Band. A festival highlight was Bach's "Tocatta in D Minor" performed by the six combined bands comprising 150+ brass players. Brass Players! Come, bring your instrument and enjoy an evening of reading brass band music with renowned British conductor, composer and arranger, Derek Broadbent. If you would like to attend, please drop Jim Littleford (jim_littleford@telus.net) an email so that we have an idea how many will be attending. Little Mountain Brass Band will be participating in the Northwest International Brass Band Festival in Bellevue, WA, on Saturday and Sunday, 2005 January 29-30. Added information about the Aboriginal Brass Band Contest in New Westminster in 1905. 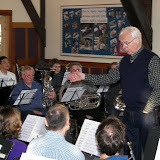 Vancouver Area Brass Band Society is pleased to announce a reading session to be directed by Derek Broadbent, well-known in the world of British brass banding as a composer, arranger, conductor and adjudicator. (See biography.) Mark your calendars for Monday, 2005 April 04. Location and event time to be announced. Little Mountain Brass Band participated in the Northwest International Brass Band Festival in Bellevue, WA, on Saturday, 2004 January 24. Other bands attending were Seattle Temple Band (Salvation Army), PugetBrass, and Spokane British Brass Band. The event was hosted by Brass Band Northwest. VABBS was delighted to present a reading session conducted by renowned British brass band composer Philip Sparke in the evening of January 22, at Marpole United Church in Vancouver. When Philip suddenly became available from previous commitments, 29 brass enthusiasts convened on 24 hours notice for the highly successful event. Little Mountain Brass Band will be participating in the Northwest International Brass Band Festival in Bellevue, WA, on Saturday, 2004 January 24. Little Mountain Brass Band has started its Fall 2003 rehearsals, and welcomes new members.